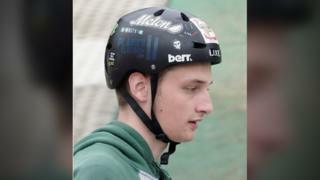 Image caption Callum Wylie "loved the mountains"
A talented freestyle skier killed himself after isolating himself from his family, an inquest has heard. Callum Wylie was found hanging in his home by his father in January, before he was taken to a hospital in Bangor. His father Kevin Wylie said the family knew the 18-year-old was depressed but had not been diagnosed. At the hearing in Caernarfon, North West Wales senior coroner Dewi Pritchard Jones recorded a verdict that Callum "did kill himself". Mr Wylie said his son, who was a student at Betws y Coed, Snowdonia, had worked shifts at a hotel the week before he died and was fine. Callum had become more distant from his family, the hearing was told. "We were worried since Christmas about his demeanour. He locked himself away," Mr Wylie said. "He hadn't been diagnosed with depression. With his Asperger's, it was a combustible mixture." Mr Jones said: "Callum was a very talented freestyle skier, mountain biker and musician. He loved the mountains and outdoors." At the time of the student's death, his family said he had opted to donate his organs. "This will be his lasting legacy," they said.